A common problem we see in the clinic is pain associated with long hours of computer/desk work. In today’s society, these activities are unavoidable; so, instead of asking people to avoid them, we would prefer to teach people how to do them correctly and without pain! The onus here falls primarily on posture and on appropriate strengthening exercises when good posture isn’t enough. In this post, we’ll give an overview of the 3 most common postural problems and how to correct them. 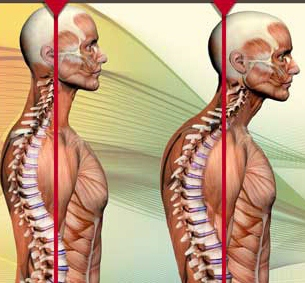 The most common area of pain with computer/desk work is in the neck, which can also present with symptoms such as numbness and tingling in the shoulders, arms, hands, and mid-back. The source of these symptoms is usually forward head posture, or leaning your head forward closer to the screen (see the video below associated with Neck Pain). This places increased stress on the muscles, connective tissue, and joints in the back side of the cervical spine which in turn place increased stress on the muscles and nerves. The desired posture is what is called “neutral spine” where there is a slight curve in your cervical spine, your neck isn’t too straight or too far forward. Your ear should be in line with your shoulder which should be in line with the midline of your trunk (as shown on left side of picture). Another inappropriate posture which can contribute to neck pain is having rounded shoulders. If your shoulders are too far forward, it can tighten the muscles in the front part of your shoulders and promote a forward head posture (previously mentioned). The best cue here is to sit tall with your shoulders back. Another common finding in patients who spend long periods of time at computers/desks is Carpal Tunnel Syndrome (CTS). Although we will go into further detail later this week, CTS can present with pain, numbness, and/or tingling in the wrist, hands, or fingers. This tends to happen when a person allows their wrists to rest on the keyboard/desk in front of them while they type which places increased pressure on the wrist. The simple fixes are to keep your wrists elevated off the keyboard/desk as you type, take frequent breaks from typing, or use an ergonomic aid (which will be discussed later this week in our post dedicated specially to Wrist Pain). Lower Back Pain (LBP) is also common among today’s computer/desk workers. LBP is very similar to neck pain in presentation, cause, and appropriate postural alignment. Presentation is pain in the lumbar spine along with potential for associated numbness and/or tingling into the legs and feet. The cause is not maintaining a “neutral spine” (slight curve without being curved too far in either direction) which places increased stress on all of the muscular, connective, and neural tissues of the lower back. One quick and easy fix here is to place a rolled up towel under the back side of your hips while sitting (see the video below associated with Lower Back Pain). Throughout the next month, we’ll discuss each of these areas in greater detail including: specific causes of pain, appropriate posture, and corrective exercises to help relieve pain and improve posture. So, keep an eye on our blog and remember that if you’re experiencing these symptoms and can’t seem to get relief, you can always come into one of our 7 locations for an evaluation.